In this hilarious collection of personal essays, Lenore Zion offers up her unique perspective on everything from foot fungi to prep school to day spas to dead birds. 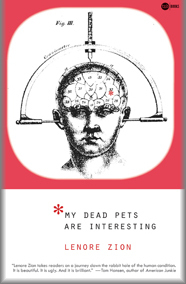 At once macabre, irreverent, beautiful, and unsettling, My Dead Pets Are Interesting is, in the end, an unimpeachably funny journey into the depths of Zion’s mind. Lenore Zion takes readers on a journey down the rabbit hole of the human condition. It is beautiful. It is ugly. And it is brilliant. Available now in trade paperback and ebook editions.